That anyway is when this map first appeared. A superb large map by Cruchley titled along the top "Ordnance Survey of the Country Thirty Miles Round London.". I have photographed the worst hole/loss. C1886 FROM G BACON LARGE SCALE ATLAS. 100% ORIGINAL LONDON KENT SUSSEX ESSEX MAP. 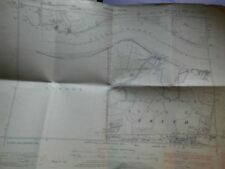 MAP IN VERY GOOD CONDITION NO TEARS NO REPAIRS. CENTRE FOLD MAP LAID DOWN ON LINEN. A highly detailed large format lithographed map of Surrey. Published by Kelly's Directories, London circa 1890. 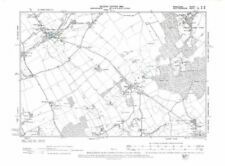 38" x 25" (960mm x 630mm) map area only with margins beyond, on light grade paper, blank verso. 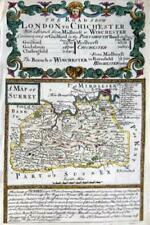 A good sized antique map of the county of Surrey including the London area. Dated in the plate. Published London 1801. by John Cary. Otherwise fine condition with the original hand colour remaining bright and fresh. THIS VICTORIAN MAP IS AN ORIGINAL. 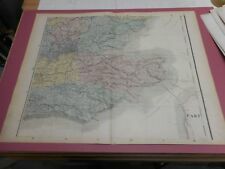 A beautiful antique map on fine quality paper EXCELLENT condition and rescued from a disbound atlas Map produced & printed by A superb map in excellent condition. London in 1813. Derived from the Horwoods Map of London. in which every dwelling house is described & numbered". This is taken from 'The Weekly Dispatch Atlas', and shows Surrey plus much of South and West London. SURREY ANTIQUE MAP BY J CARY DATED 1822 ORIGINAL COLOUR NEW MAPLE FRAME 7"x9"
Original Antique map with original colour dated 1822 by J.Cary. BY T MOULE C1848. 100% ORIGINAL SURREY MAP. MAP IN VERY GOOD CLEAN CONDITION NO TEARS NO REPAIRS. Surrey Docks, Deptford. 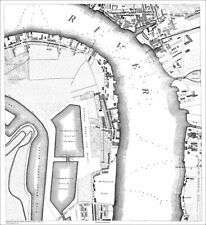 Surrey Docks, Millwall Docks, West India Dock (Export) and South Dock, The Cooperage, Mast Pond. London in 1888 (Deluxe Edition). A REPRODUCTION MAP, ENHANCED & ENLARGED FROM THE ORIGINAL. Surrey Docks, Deptford. London in 1888. Derived from the Atlas of London & Suburbs by G. W. Bacon. THIS IS SHEET NUMBER 26. As a flat-sheet map it is perfect for research or framing (in whole or in part). In Surrey it covers part of the Surrey Downs (shown running alog the bottom of the map) including Box Hill, Reigate & Leatherhead. Antique map with original outline colour, 1863. DATE PRINTED: 1863. Title of map:'Environs of London (sheet 6.)'. 'Environs of Manchester; Environs of London'. Title of map:'Environs of Manchester; Environs of London'. Antique colour map, 1897. PROVENANCE: "The World Wide Atlas of Modern Geography Political and Physical"; by J. Scott Keltie; Published by W. & A. K. Johnston, London: 3rd Edition [World wide atlas]. MAP OF SURREY. A folding map of Surrey with the railways prominently displayed. A lithographed map with original hand colouring and a wealth of topographical detail. 22" x 20" (560mm x 500mm) overall. [Sheet 8 - Surrey]. Title of map:'[Sheet 8 - Surrey]'. DATE PRINTED: Published 1st May 1816, but later railways inserted. PROVENANCE: Engraved at the Drawing Room in the Tower by Banjamin Baker & assistants. LETTS'S COMPLETE POPULAR ATLAS - 1ST EDITION 1883. AN ORIGINAL ANTIQUE MAP OVER 130 YEARS OLD FROM To find the approximate size of this map. QUICK SALE AT A FAIR PRICE. 'THE ENVIRONS OF LONDON'. Title of map:'THE ENVIRONS OF LONDON'. Antique steel engraved map with original hand colouring (color), 1844. DATE PRINTED: This map was originally published by Baldwin & Cradock in 1832; this date is printed on the map. With a large scale plan of Claygate on the reverse. This reprint map is a must for the historian, genealogist and anyone interested in the local history of South London around the 1893 census period. Antique steel engraved map with original hand colouring (color), c1844. 'THE ENVIRONS OF LONDON'. Title of map:'THE ENVIRONS OF LONDON'. CONDITION: Good; suitable for framing. DATE PRINTED: This map was originally published by Baldwin & Cradock in 1832; this date is printed on the map. BY CREIGHTON C1842. 100% ORIGINAL SURREY MAP. MAP IN VGC CONDITION NO REPAIRS NO TEARS. ORIGINAL OUTLINE COLOURED. AN ORIGINAL ANTIQUE MAP OVER 135 YEARS OLD. This map is from a series produced for. BY LETTS C1884 ORIGINAL COLOUR. 420MM X 340MM SHOWS RAILWAYS. 100% ORIGINAL SURREY MAP. MAP IN VERY GOOD CONDITION NO TEARS. Published by John Cary, London 1819 in his. Dated (1819) and credited to Cary in the plate. An attractive miniature county map of Surrey & London with original, outline hand colouring. The plates were re-engraved for the editions of 1806 and 1822. Publication Date: 1895. Publisher: G.W. Bacon & Co. Ltd, London. 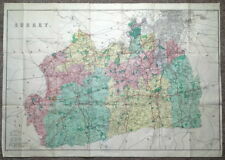 This antique map is one of a series produced for Approximate size of fold-out sheet. A map of Southern England extending as far north as Stafford. The map is very well detailed. MAP BRITISH ISLES. ENGLAND, WALES, SCOTLAND & IRELAND. Within the Uk. Goods will not dispatched until cheque/bankers draft have cleared. 'Environs of London and environs of Manchester'. Title of map:'Environs of London and environs of Manchester'. PROVENANCE: "The World-Wide Atlas of Modern Geography"; By J. Scott Keltie; published by W. & A.K. Johnston, London: 2nd Edition [World wide atlas]. 'Environs of London and environs of Manchester'. 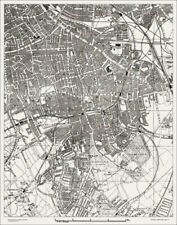 Title of map:'Environs of London and environs of Manchester'. Antique colour map, 1892. PROVENANCE: "The World-Wide Atlas of Modern Geography"; By J. Scott Keltie; published by W. & A.K. Johnston, London: 1st Edition [World wide atlas]. Antique colour map, 1898. DATE PRINTED: 1898. The image below shows an enlarged cross section from the centre of the map to show the level of printed detail. This map is folding hence the centrefold line may show on the image below. 'Northampton; Buckingham; Berks; Hants; Bedford; Hertford; Middlesex; Surrey; Kent; Essex; Cambridge' (England Map 17). Title of map:'Northampton; Buckingham; Berks; Hants; Bedford; Hertford; Middlesex; Surrey; Kent; Essex; Cambridge'. Framed Map of SURRY by J. Cary Engraver London Published May 1, 1810 8.5" x 6.5"
It reads: London Published May 1, 1810 by J. Cary Engraver No. 181 Strand. The bottom of the map lists different distances (i.e., London to Bletchingley, etc.). For example, if possible, I will add a photo of an angle not originally provided.